Wilton’s began life as the Mahogany Bar, which it was known as from 1839 until 1850. The music hall was built on the same site in 1858. The hall could hold 1,500 people and presented many performances until a fire closed the building in 1877. The hall was slowly rebuilt and became a church in 1888 (after the East End Mission took over in 1885). The building ceased to be used as a church in 1956 and became a rag warehouse. When the building was threatened with demolition in 1964, a successful campaign allowed it to be bought by the Greater London Council. The hall began staging performances again in 1999, and became a producing venue in 2004. 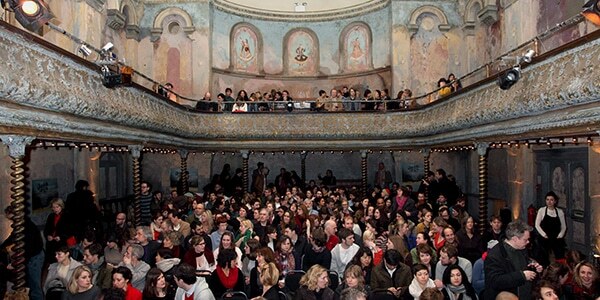 Its current owner is the Wilton’s Music Hall Trust. Further repair works will be carried out in April 2014. The hall hosts cinema screenings, magic shows, live music, history tours of the building, ping pong tournaments, and theatrical productions. All spaces are available for hire.